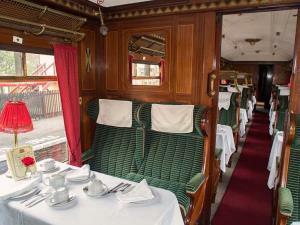 An evening of Yorkshire Fish & Chips aboard our steam hauled land cruise. The Real Ale Bar Car, live music and dancing at Keighley round off your evening’s experience. These special evening trains depart Oxenhope at 7:15pm for two leisurely return journeys along the branch with a pause at one of our superbly restored stations while the food is served. Our award winning Real-Ale Buffet Car will be open on the train serving a wide range of alcoholic and non-alcoholic drinks. For everything you need to know about the Haworth Haddock and to book on-line, visit the Keighley & Worth Valley Railway website.